One of the greatest things about our location in Corvallis is that we are on 1st Street. There is a park and the Willamette River right across the street and every Wednesday and Saturday the Farmers Market is in full swing. 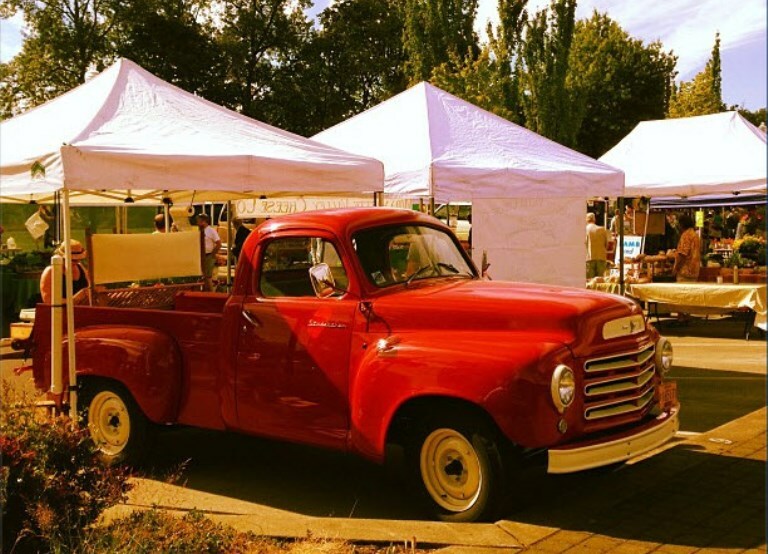 Today, I walked out the front door and not 50 yards away was this beautiful red pickup truck that belongs to the Territorial Road Orchard booth. 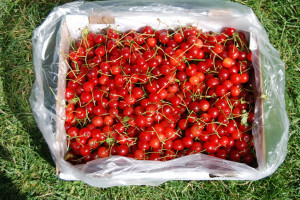 Red is an appropriate color because here in the Willamette Valley cherries are just becoming ripe. Oregon has a healthy cherry crop business but most are grown around Mt. Hood and the Columbia George. Years back there was a sizable industry growing the marasca cherry, used to make the sugary sweet maraschino, best enjoyed on the top of a sundae or in a Manhattan. Today, fresh cherries are in demand. Probably because they are so wonderful just to snack on or make into a fresh cherry pie. Michael was down at the Community Table and he stopped by on his way out and grabbed some sour cherries, which are ideal for deserts including George Washington’s favorite, the cherry pie. I didn’t have time to give him this recipe but here it is for you. This is my favorite cherry pie and a unique way to have dessert and yet get an amazing amount of antioxidants. Makes enough for the bottom and top and extra for one additional bottom (can you say Lemon Meringue pie too?). Put the cherries and sugar in a saucepan, blend the cornstarch and juice together and add. Bring up heat to almost a boil then simmer for about 15 minutes stirring often. Remove from heat and add the cinnamon, nutmeg and extract. While the filling is cooking start the pastry. Crumb together the flour, sugar, salt and butter with a pasty knife or 2 forks. Mix the egg, vinegar and cold water together and add, blending until just mixed. Form the dough into 3 balls saving one for the Lemon Meringue pie or wrap in plastic and refrigerate or freeze for later. On a lightly floured surface, roll out one ball for the bottom of a 9 inch pie plate. Add the filling then roll out the other ball for the top. Crimp the edges, cut some pretty slits in the top, place on a cookie sheet to catch drips and put into the oven. Bake 30 to 35 minutes, remove from oven, fend everyone off, get out some vanilla ice cream and dig in.